Hopper is an automated planning and scheduling tool for Instagram, enabling brands to create, plan, schedule and preview posts in advance, across multiple accounts. The platform is designed for social media managers within either a brand PR, social media or marketing agency to help increase account presence, quality and engagement. Hopper's advanced planning and editing features help social media managers increase the quality and consistency of their social media accounts whilst helping to save time. Users can automatically post scheduled content to Instagram without the use of 'reminders' or push notifications. The posts queue keeps all scheduled posts in one place, with drag and drop functionality to reorder. 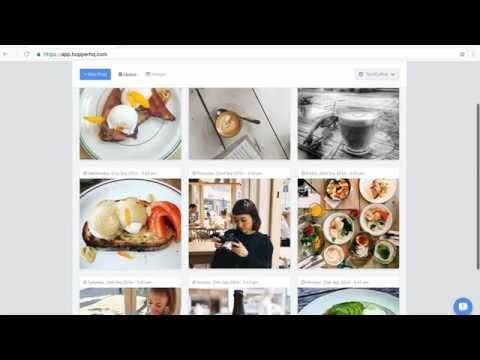 The calendar planner lets users view and plan posts by week or month, while the phone preview allows users to see how posts will look to follows on a mobile. Additional features include an image editor complete with filters, adjustments, orientation, borders and text overlays; a post creator enabling hashtags, @mentions, captions and first comment support; and bulk upload which allows users to upload up to 50 posts at once, auto set times, and save all posts to the queue or as drafts. Saving a huge amount of time managing our Instagram accounts, Increasing the quality of our social media marketing. It's very quick to upload and schedule lots of content. We upload a month in advance and then add other posts and comments as needed. It takes us about 30 minutes to create and schedule a month of regular posts. The newer features to view and plan your feed have been brilliant to help increase the overall look and feel of our Instagram accounts. It's very quick to upload and schedule lots of content. We upload a month in advance and then add other posts and comments as needed. It takes us about 30 minutes to create and schedule a month of regular posts. The newer features to view and plan your feed have been brilliant to help increase the overall look and feel of our Instagram accounts. There are 3 of us the use the tool and all share one login. Together we manage 5 Instagram accounts via Hopper HQ. It would be good to have the ability to login separately and maange different accounts. Only a minor point but would be a nice addition. Thoroughly happy with Hopper HQ and will not be using any other product or service from any competitor. Extremely easy to use! The ability to set it and forget it makes life much easier when building an Instagram, Facebook or Twitter account. Customer support is easily accessible and they are all very friendly. Hopper HQ even asks customers to recommend additional features that they would like to see in the future. Strongly recommend Hopper HQ! Extremely easy to use! The ability to set it and forget it makes life much easier when building an Instagram, Facebook or Twitter account. Customer support is easily accessible and they are all very friendly. Hopper HQ even asks customers to recommend additional features that they would like to see in the future. Strongly recommend Hopper HQ! I've asked if Hopper HQ can add the ability to add location to the posts so that it's possible to tag a location. They explained that they have received that request from others and are definitely aware that customers would love to have that feature. Biggest benefit is time saving and the ability to schedule posts in advance. Also ease of use (instead of posting from your phone) and ability to scale out and manage multiple accounts.Hopper HQ is very easy to use and a huge time-saver, allowing me to schedule weeks worth of posts in just minutes. The preview mode is great to assist with the aesthetics of your profile. Having access to your history of posts AND the ability to "re-schedule" a post is VERY helpful. It's invaluable to have the ability to type in your caption (with emoji's) AND at the same time post a first comment (usually for hashtags). However my favorite feature is the image editing that utilizes Adobe Creative Cloud tools and features, which makes for editing your images easy and professional. This software provides far more value than what you're paying for! The things I like least about this software are a couple of needed features, that I think would complete this software: 1) I'm unable to post a multi-image slide show type post to Instagram. Currently only one image per post is supported. 2) I'm unable tag my Instagram post to also post to my Facebook business/fan page when it posts to Instagram. Peace of mind.I find Hopper to have a functionality and ease of use that I've not had before. When we have had issues with the software, customer service has always been top notch! This has changed my day-to-day posting, especially with Instagram. There has not been another app that is as easy to use as Hopper HQ and that actually posts for you once you've scheduled everything. This has made my lift so much easier as a creative and marketing director.I like that the software actually posts scheduled content instead of just sending you a push notification. GAME CHANGER! I also like that I can schedule Facebook and Instagram posts simultaneously with ease. SO HAPPY with the gallery post integration! I like that the software actually posts scheduled content instead of just sending you a push notification. GAME CHANGER! I also like that I can schedule Facebook and Instagram posts simultaneously with ease. SO HAPPY with the gallery post integration! Hopper pricing begins at $19 for one account on a monthly plan. This reduces to $10 per account for 10 or more accounts and $8 per account for 100 or more. A 15% additional discount is available for all annual plans. All Hopper HQ plans come built in with a 14-day free trial. Hopper is a fully automated Instagram scheduling tool which remains in line with Instagram’s terms of service. With advanced planning and editing functionality, Hopper helps thousands of brands across the world manage and grow their Instagram presence. Aligned to a social media managers workflow, Hopper helps increase agency efficiency and Instagram success. Hopper supports every major cloud storage product and social network. Manage multiple Instagram accounts from a single Hopper login. Below are some frequently asked questions for Hopper. Q. What type of pricing plans does Hopper offer? Q. Who are the typical users of Hopper? Q. What languages does Hopper support? Q. Does Hopper support mobile devices? Q. Does Hopper offer an API? No, Hopper does not have an API available. Q. What other apps does Hopper integrate with? Q. What level of support does Hopper offer?